When you shop for your wedding dress, you will find several local area bridal shops. Love Couture Bridal is a shop in Potomac, MD. The bridal shop services brides from Washington, DC, Baltimore, and Virginia areas. The store has bridal gowns, bridesmaid gowns, and bridal accessories that include veils, shoes, headpieces, and necklaces. They offer customers a unique pampering experience while they look at and try on wedding gowns. They create a positive experience for customers and strive to take care of every detail as they help brides feel beautiful on their wedding day. The bridal shop has a large selection of designers with a wide range of elegant gowns. The Marisa Collection features gowns made of luxurious silk and lace. Some of the gowns have a daring look with the backless designs. Traditional elegance and modern designs are combined for the bridal gowns in the Marisa Collection. Strapless gowns with chapel trains and stunning mermaid gowns with draped skirts are part of the collection. The wedding dresses in the Hayley Paige Collection feature a feminine style. Each dress is unique and flatters the bride. Embellishments include sheer fabric and hand applied appliqued lace. Strapless gowns with full tulle skirts or flounced tulle and organza skirts and chapel trains are part of the collection. A-line dresses that flatter all brides are stunning with keyhole backs and tiered skirts in this collection. The Cristiano Lucci Collection features several styles of mermaid dresses. The form fitting gowns come in strapless styles as well as some with sheer yolks. The gowns flare at the knees into a dramatic full skirt. The sophisticated gowns feature embellishments including beading and lace. They are made of material that include satin, lace, and tulle. 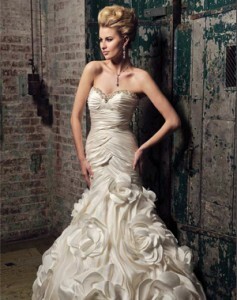 Elegant strapless ball gown styles are part of the collection. The YSA Collection features a striking strapless mermaid gown with a ruched and pleated bodice and waist. The sweetheart bodice is trimmed with beading. The flared skirt is made of lovely flowers for a feminine and romantic look. Gowns in the collection are made of satin, tulle, and lace. Embellishments include beading and lace. The dresses in the Karen Holmes Collection feature trendy gowns for brides. The collections include Bespoke, Couture, KWH, and Complete. One gown in the Bespoke Collection features a V-neck bodice with a skirt in georgette and ruffled sleeves. It is embellished with beaded details on the shoulders and waist. The center front bodice can be folded into side panels and draped to the back. The gowns are made of materials that include lace and satin. The gowns in the Matthew Christopher include an elegant strapless trumpet dress made of silk chiffon with a floral lace overlay. 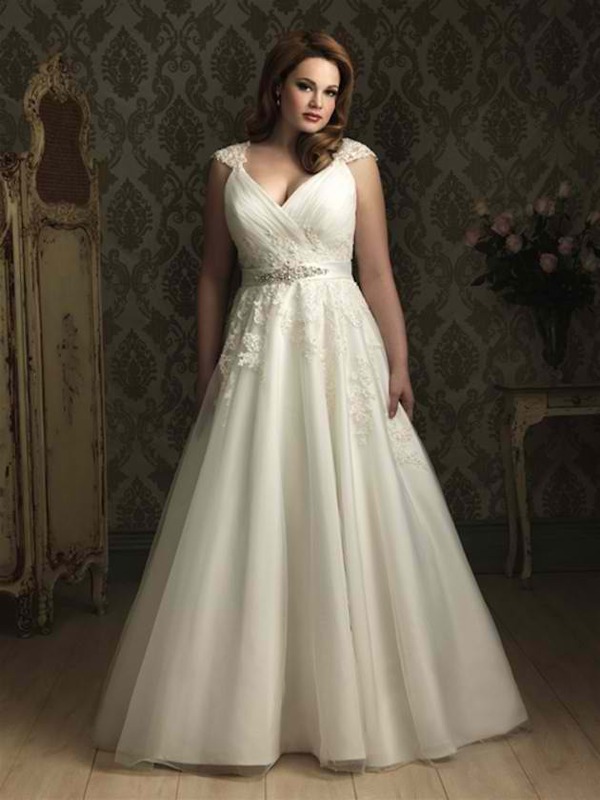 It has a sweetheart neckline and chapel train. The gowns in the collection have a feminine look. Many of the lovely gowns softly hug the body and they are embellished with bows and lace. Matthew Christopher will custom change gowns for Love Couture brides and he visits the shop twice a year during trunk shows. Gowns in the Lazaro Collection feature glamorous styles that have hand beading, embroidery, and floral elements. The ivory tulle ball gown features off the shoulder straps made of lace. With Alencon lace bodice and a full circular skirt, that has a layered horsehair hem and sweep train the dress is elegant. Many dresses in the collection have full flowing skirts made of materials that include lace, tulle, and organza. The exquisite skirts flow around the bride in soft waves to make any bride look like a princess. 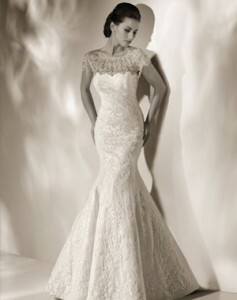 Love Couture has a selection of Watters Collection bridal gowns. The stunning hand beaded silk charmeuse slip dress has a Bateau Italian illusion net neckline. This dress is full of femininity with the soft netting panel skirt that swirls with every movement of the bride as it falls into a sweep train. The gown has a satin waistband for a touch of elegance. Other styles of gowns include mermaid and ball gowns. The Encore Collection features lovely short dresses that are appropriate for weddings and receptions. They offer an affordable dress for brides. One dress features cap sleeves, a Queen Anne illusion neckline, and a lace covered back. It has a satin ribbon sash, shirred bodice, and soft netting. Other dresses include strapless styles, sleeveless designs, and flattering A-line styles. The Yolan Cris Collection includes collections of Romantic Tale, Romantic Vintage, Boho Girl, Glint Couture, and Couture Treasure. The gowns are made of lace and satin. 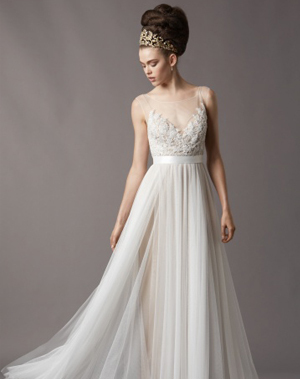 A lovely V-neck gown that softly hugs the body as it falls into a long skirt with a train features a tiered skirt. The gown is embellished with lace. The layers of the skirt provide a romantic look. Gowns with simple elegance are featured in the collection.